I have my Solar panel wiring entering the van just above the rear closet in my Westfalia. I needed to run these wires to the front of my van where my Solar Controller will be installed. By drilling a single hole in the rear closet I was able to do so pretty easily. I’ll detail out the process below. 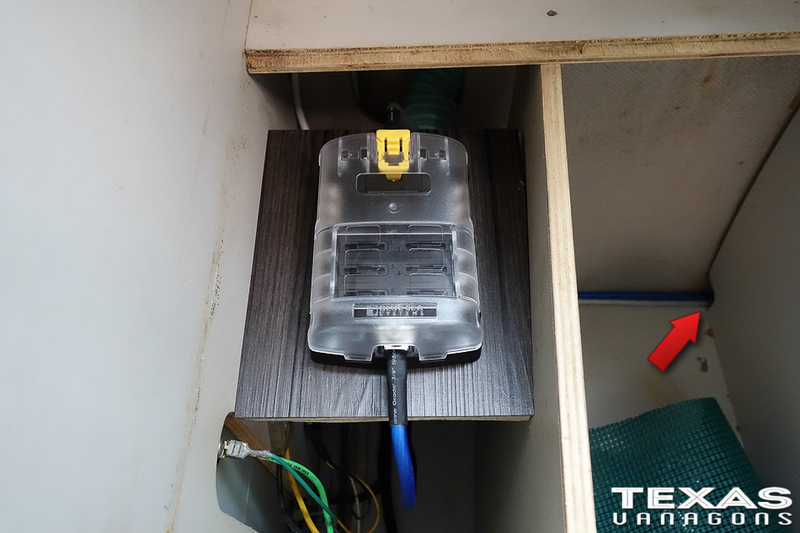 I used my Dewalt Compact Right Angle Drill and the Steelex 1-3/16″ Forstner Bit I keep around in order to drill holes for my Blue Sea 12v Sockets and Dual USB Ports. This view is from the rear of the van, the textured wall on the left is the driver’s side wall. You can see two pieces of overlapping grey panels. The shorter one is the forward most face of my rear closet. It’s the one that contains the long, skinny vertical door and mirror. The other grey panel is the rear most face of the middle cabinet which houses the water tank. The trick is to drill through only one panel as high as you can without touching the rear closet panel. This will place the hole just above the water tank, drill this hole slowly and carefully as not to damage the water tank. Forstner bits tend to “eat” through the wood panels pretty easily with little pressure. 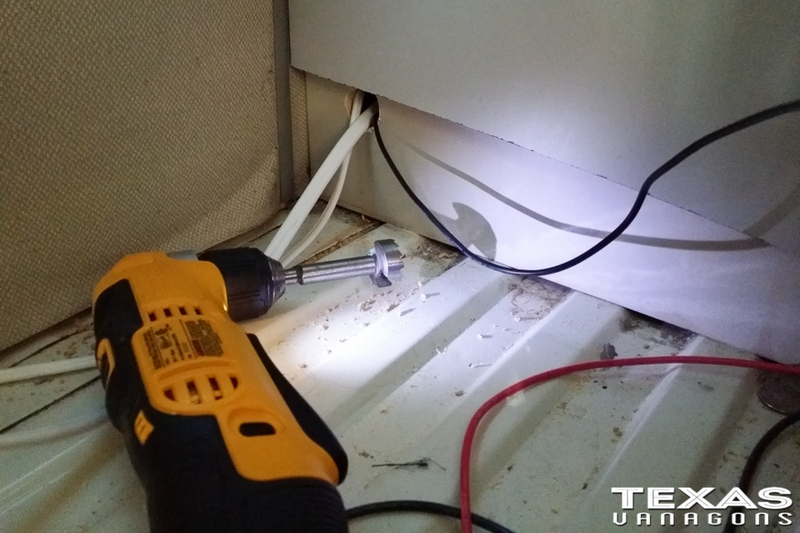 Once drilled, you can then fish your wiring through the hole and into the middle cabinet. I use a Cen-Tech Fiberglass Wire Fish Rod by taping the end of the wire to the tip of the rod and then running the rod through the hole and out through the other side. Having some sort of wire fishing rod helps a ton! 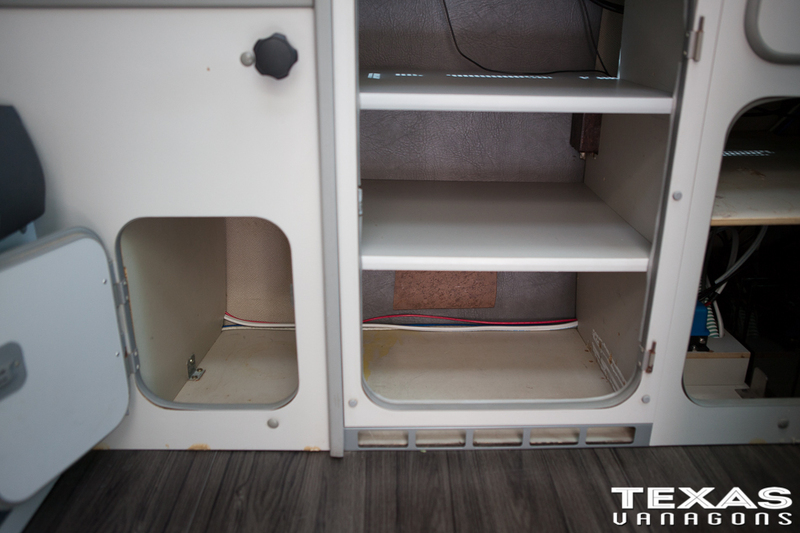 If you remove the metal water tank cover in the rear flat cabinet compartment of the middle cabinet you’ll be able to see your wiring run on top of the tank. Perfect. 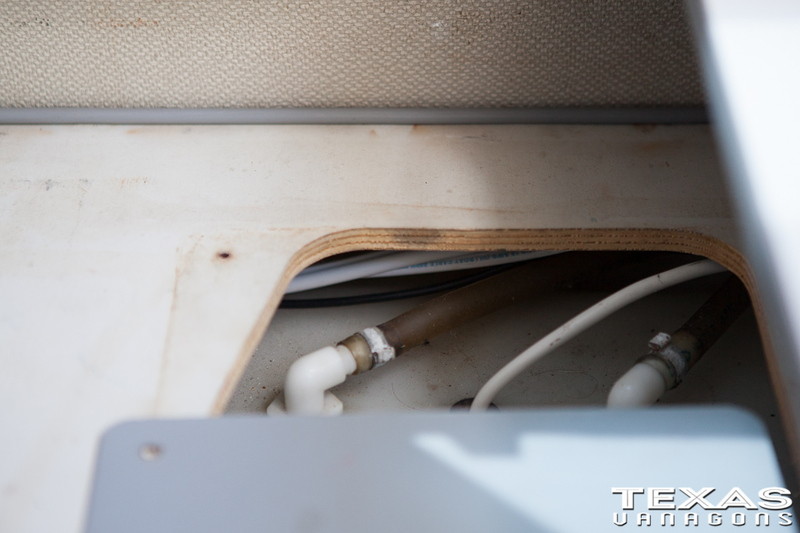 Opening the front flat cabinet compartment of the middle cabinet you’ll see the stock opening which allows the water hoses to feed through. 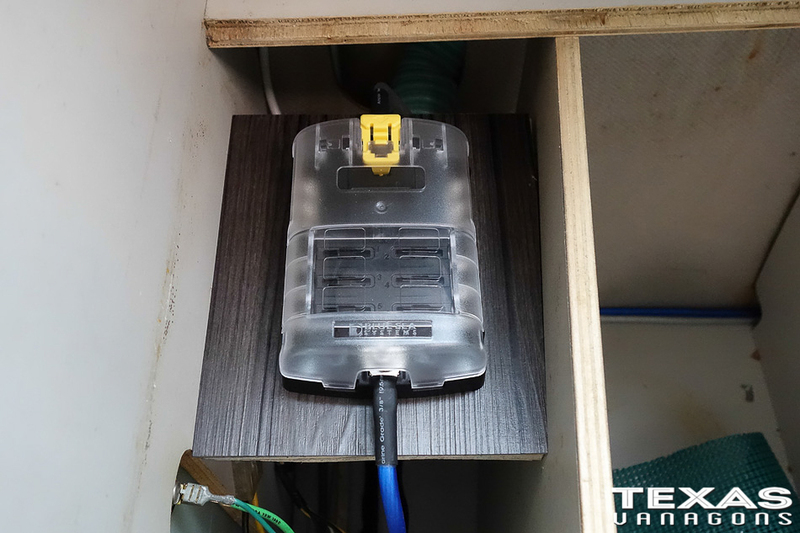 Run your wires through that opening and down into the voided area behind your 110v receptacle and fuse panel. Mental Note. 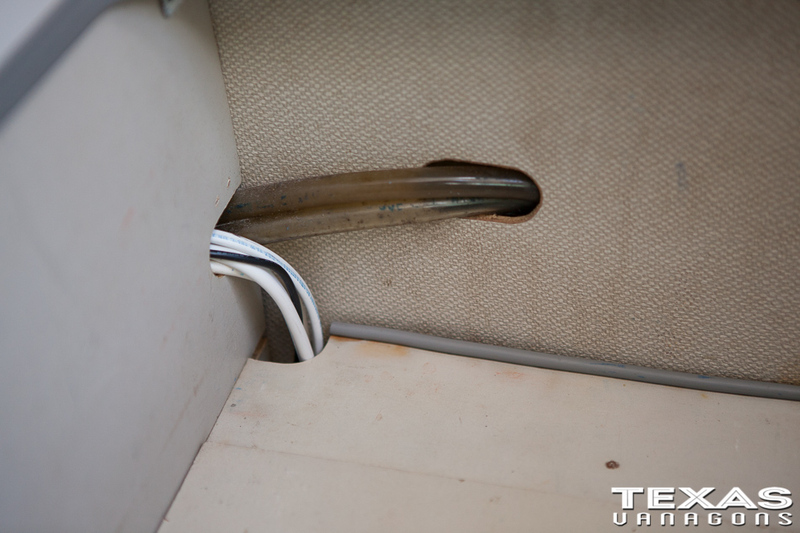 Add replacing my water hoses to my never ending list of Vanagon Upgrades! Yikes! Lol! Side note. Underneath that removable floor in the front flat compartment I have a Blue Sea Fuse block mounted there for my rear accessories to draw power from. 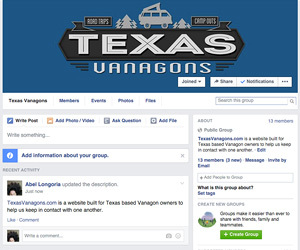 For the installation of this fuse panel you can visit THIS POST. Once the wires are down into that voided area you’ll notice theres a round weep hole that’s in the vertical wall. There is a weep hole in all of the vertical walls from this point forward so you simply route your wires trhough them. Easy Peasy. Here you can see the wiring I’ve ran through the cabinets. 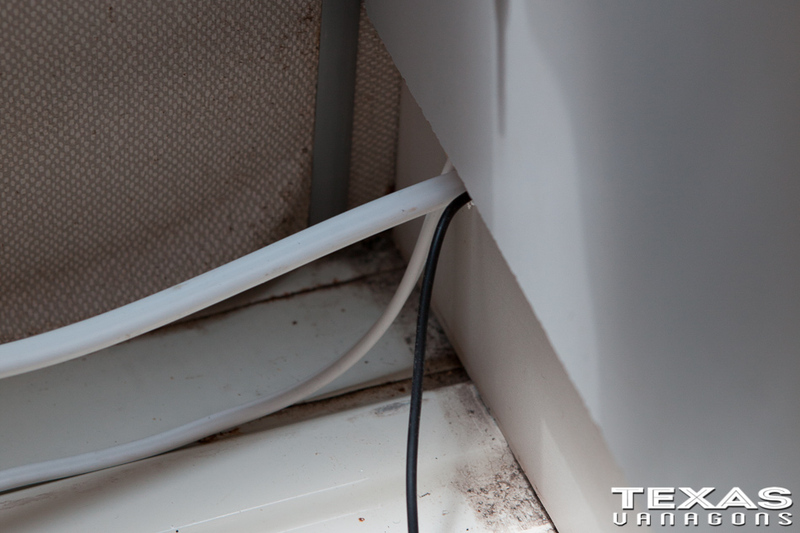 The weep holes are nice as they help keep your wires nice and neat to the furthest back edge of the cabinets.